Pics and Kicks: Fancy a Giggle? I am laughing so hard right now. Care to join me? Ha! I LOVE that! What a darling baby!! hahahahaha sooo CUTE! Caught in the act huh? :) Sorry, I didn't realize with my head in a daze after having baby! Yes I have a blog! You are welcome anytime, glad you found it! 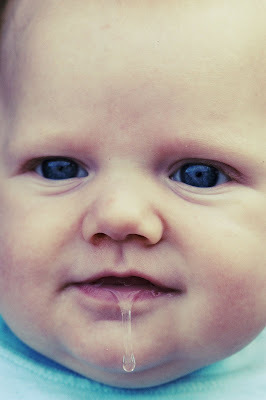 That's awesome you actually caught the drool string. Love it! and wonderful picture great work.